We watched the weather daily, actually twice daily, looking for any favorable changes in the predicted wind and precip patterns up high. 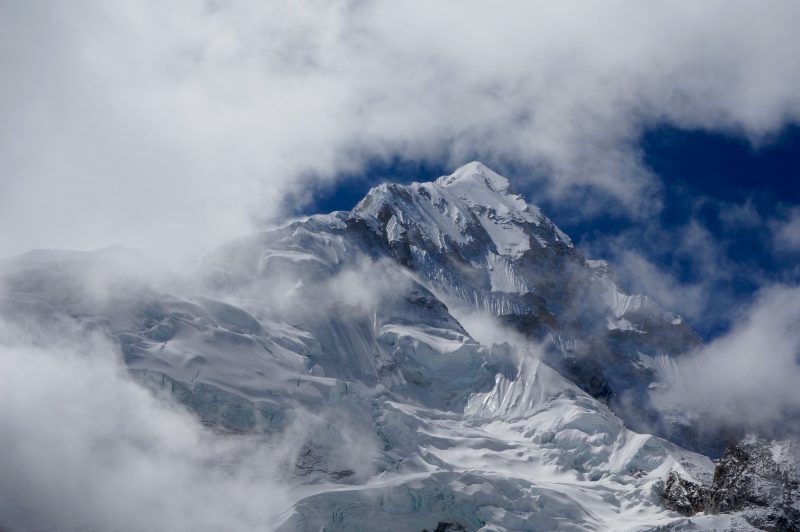 Initially we hoped for summit conditions on May 21, but the wind speeds remained high on two different models, and there seemed little hope of shooting for the summit before May 23. 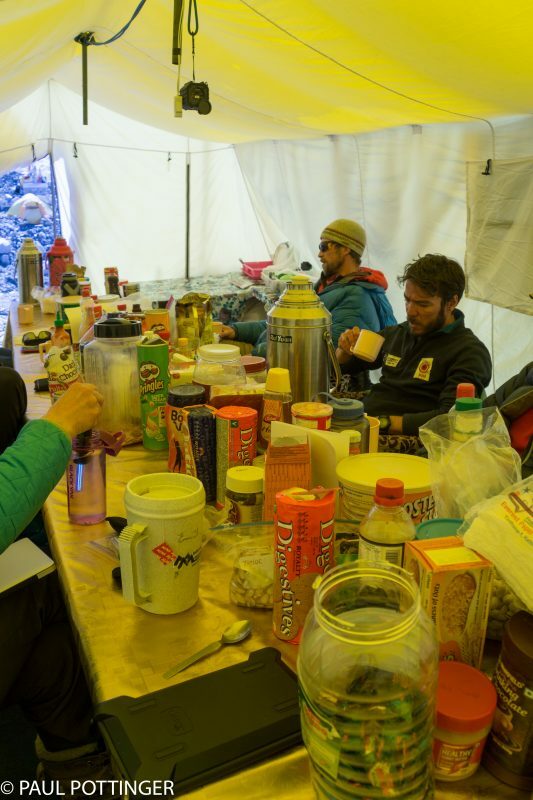 Justin reminded us at breakfast that things can change in a heartbeat, and that we should “plan” to leave for the summit early the next morning… but, our assumption was that we had several more rest days in store. I wanted to stretch my legs, and decided to walk around EBC and snap some photos. 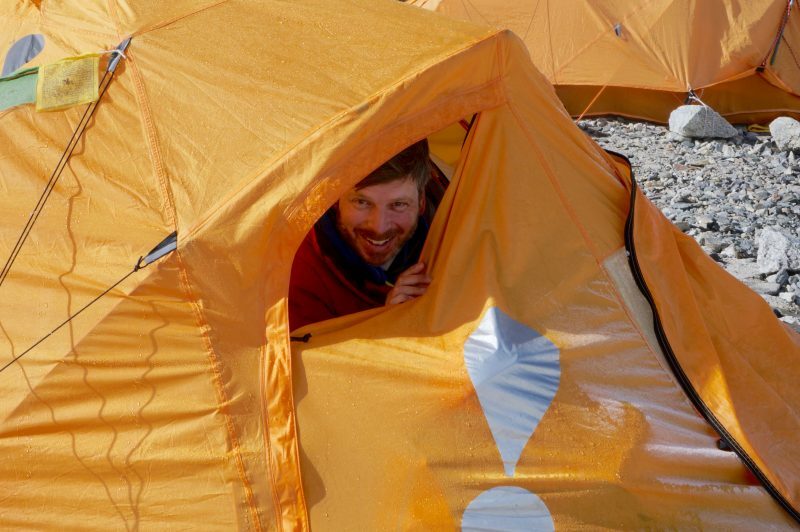 Our awesome Sherpa crew shows up after breakfast, kicks me out of the tent, moves it, and rebuilds the platform that has slowly been sinking into the glacier this past month. Awesome remodel! 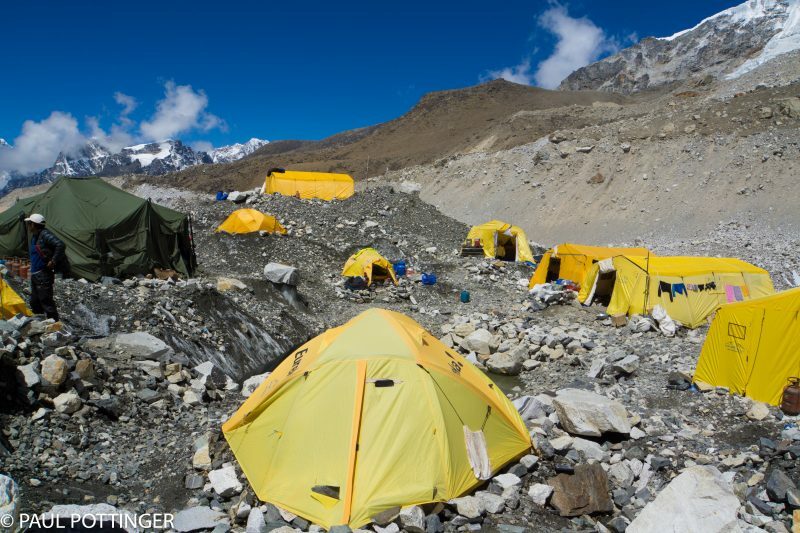 Team Hybrid’s tents line up on the glacier. Note our solar panels, charging up Kim’s battery for the day. Sunshine turns frost to dew on our tent flys. 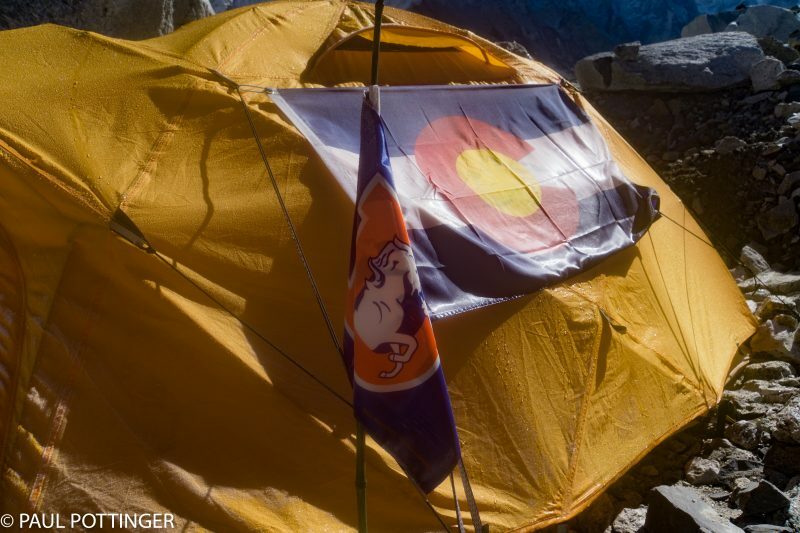 Kim’s tent livery is highly Colorado-centric. Mine seems a bit more culturally-appropriate. I’m like that. 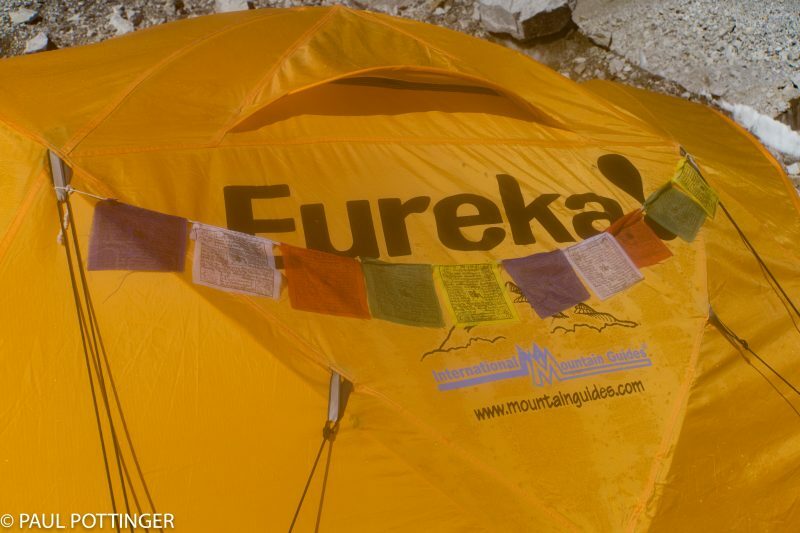 The meal tent at EBC abounds with sundry delicacies…. many originate at Costco, others have less mundane sources, such as Hunduran jam and Saudi syrup. My bluetooth speaker hangs from the ceiling… although we rarely used it. Our Puja Altar remains strong, a center of the camp. 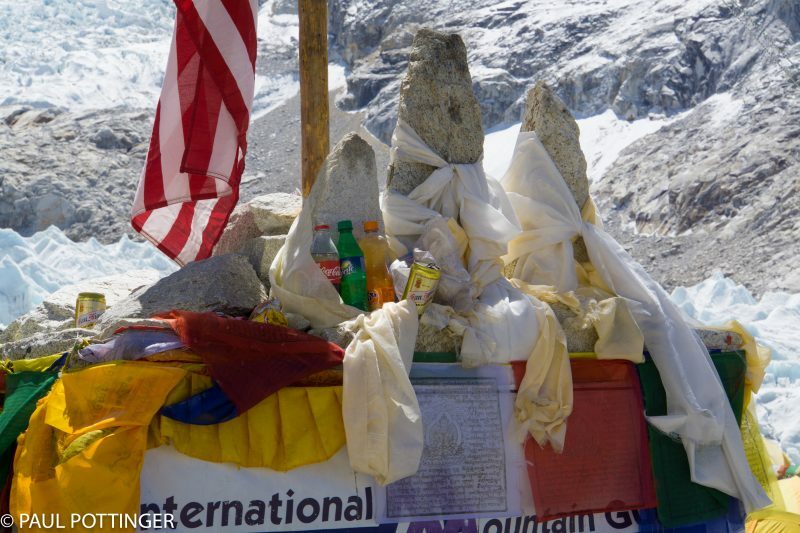 Offerings to Miolangsangma atop the Altar. View of central camp from the Altar. Our meal tent is dead ahead, door open to the fine air. Cook tents on the right. HQ tent atop the small hill just to the left of center. 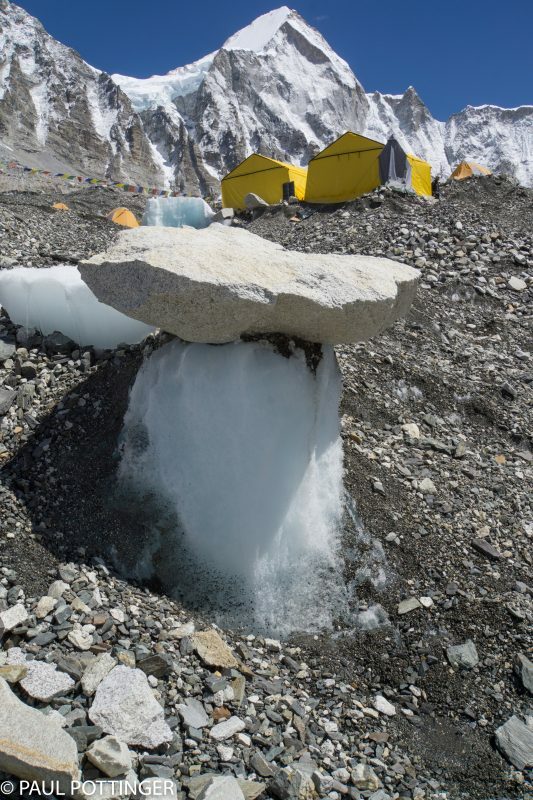 A river runs through EBC… and some enterprising Sherpa use it for laundry. Why not? 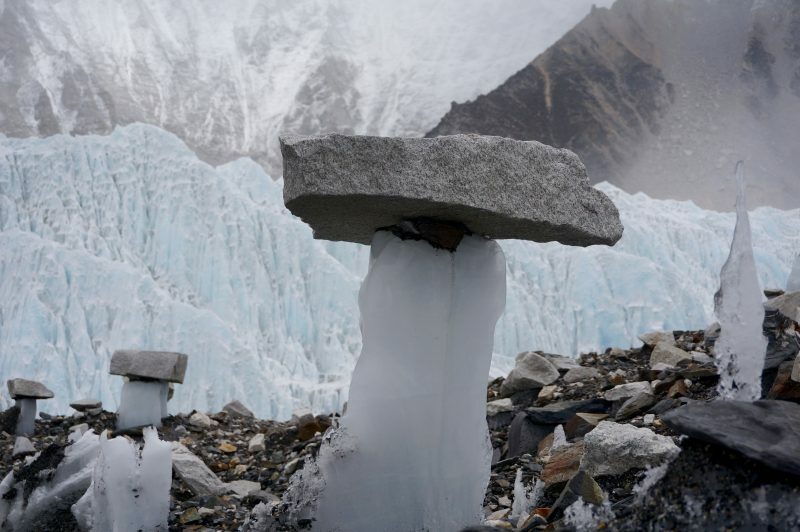 These curious pedestals are found everywhere in EBC, by the thousands: The stones shade underlying ice, retarding their melt cycle compared with surrounding ice. Result: rock-topped towers. Cool. 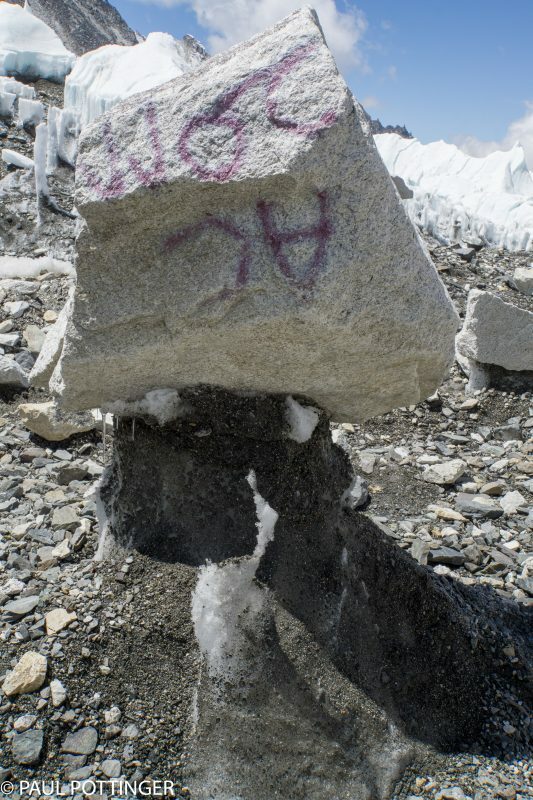 This block gives a sense of the timeline and life of boulder movement on the glacier: It marked the entrance to Adventure Consultants’ camp in 2011. Now, 5 years later, it has migrated down-valley and is upside-down. Glaciers are alive and moving, no doubt. Some pedestals are bigger than others… this one is the size of a compact car. Gardens of pedestals mark the lateral moraine. I remain in awe of these strong, stoic, people. 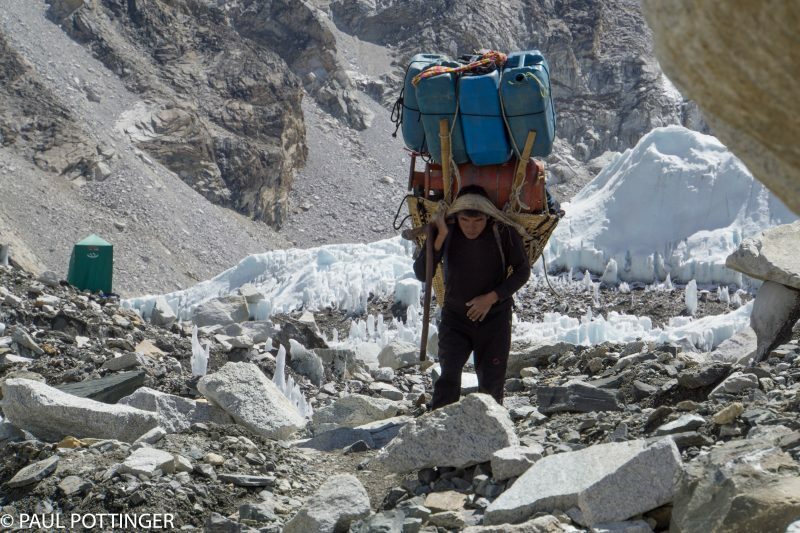 If I had one-tenth of their strength, Everest would be easy. 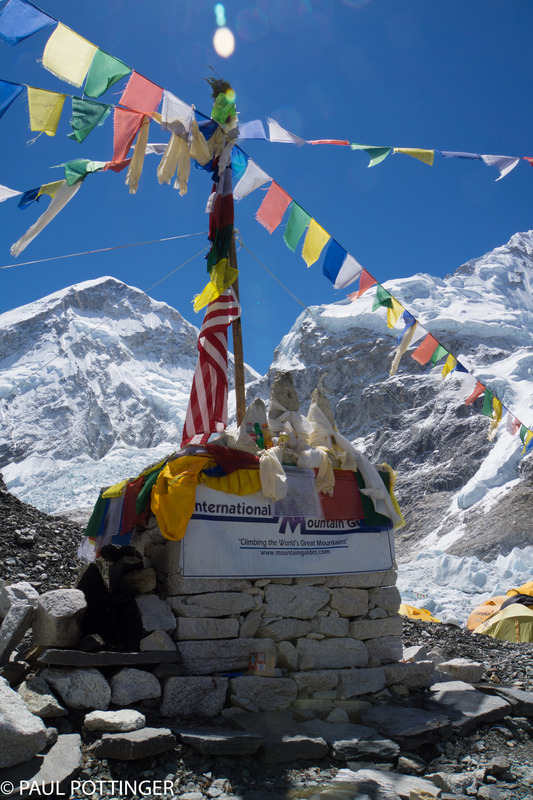 When I reached the top of EBC I decided to go “treasure hunting,” meaning searching for interesting or unusual artifacts. I went two waves past the current entry point to the glacier (our “crampon point”) and turned in to a flat tongue of ice. No footprints on the snow… this area appeared not to have been touched since last year, when it served as crampon point for the 2015 season. 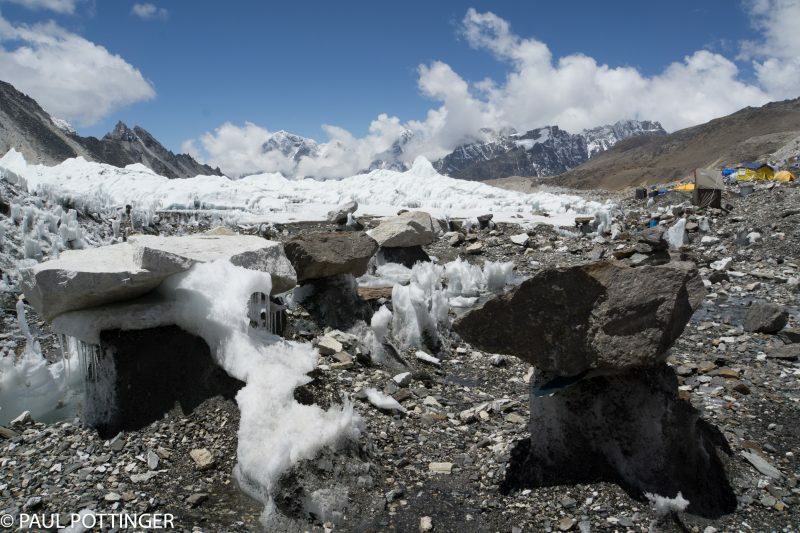 At a glance it was pristine and natural… on closer inspection, the ice was riddled with millions of bits of “micro trash,” tiny shards of rigid and fabric plastic that were welded into the ice by the freeze-thaw cycle. 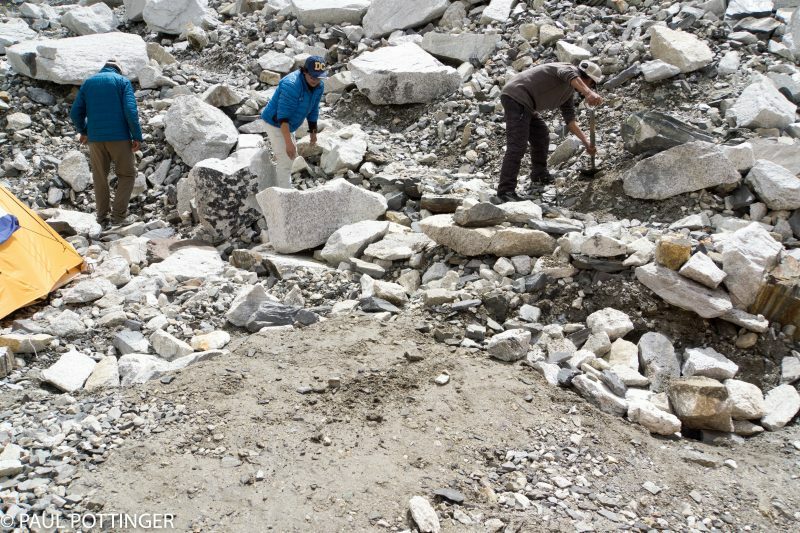 Most of the “big” wreckage from last year was gone, picked clean by human hands—I am told that the Indian Army stood up in a big way to assist with this effort. 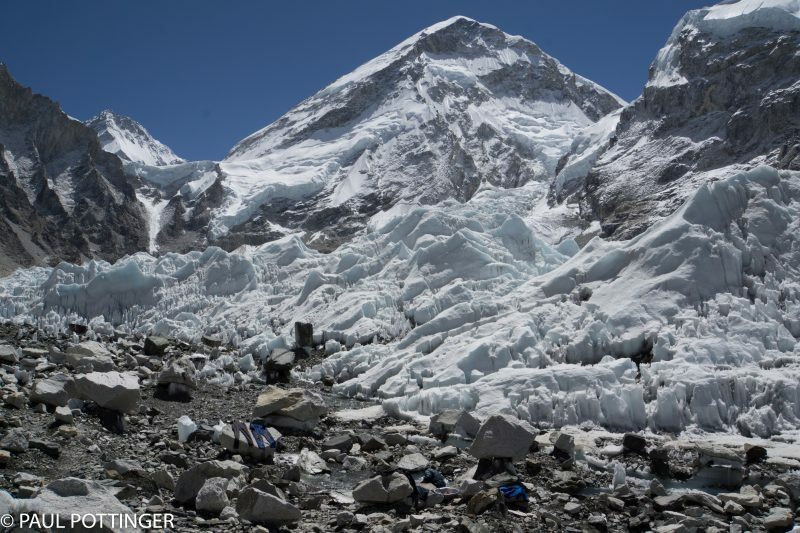 But the micro trash can never be cleaned up properly… it will have to make its way down the glacier, at glacial speed, and ultimately be dumped into the moraine which is home to Dukla, Pheriche, and is the watershed for the entire Khumbu valley. I suspect it will take a century for this to happen, although I could be mistaken. A rare find: macro-trash from the quake and blast last year. 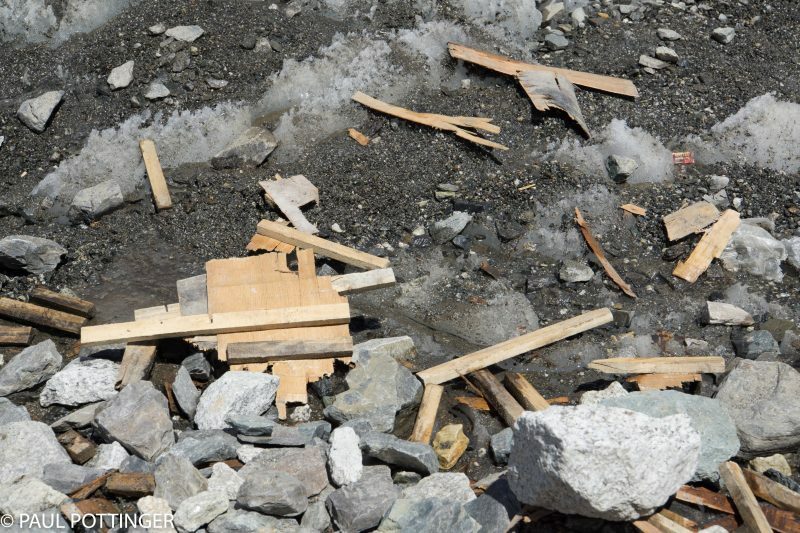 These shards belong to a wooden O2 canister carrying case (Poisk, not IMG O’s). I suppose this wreckage will be pulverized and biodegraded in the coming decades. 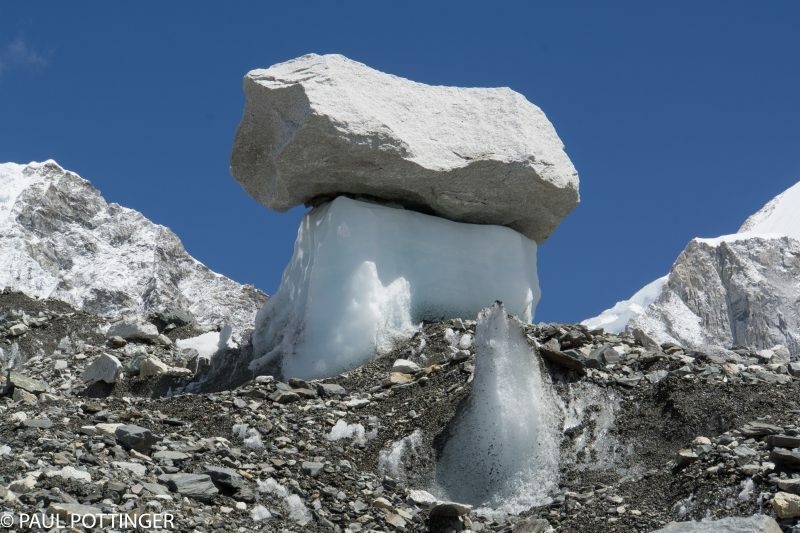 All around me, on the walk through EBC and in the glacier itself, were signs of spring: The ice was melting. A beautiful river always runs along the lateral moraine, and it had grown in force and width even in the last few days. Parts of it look exactly like a water slide, complete with person-sized chutes and exciting twists and turns. 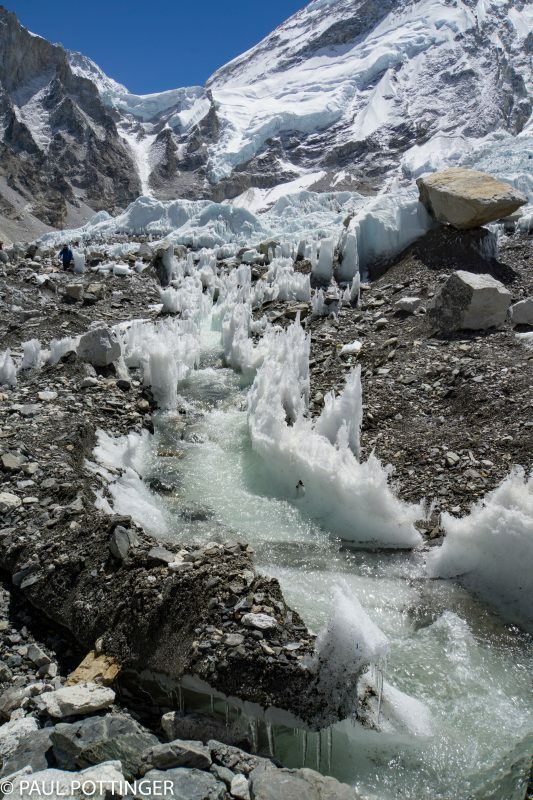 We joked about running these rapids in celebration after our summit was achieved (just joked), but now the force and volume of the water made that idea into a farce: the Khumbu was turning into liquid, fast and furious. This may be a normal part of the annual cycle, but it seemed like a major and unexpected change to me this early in the season. 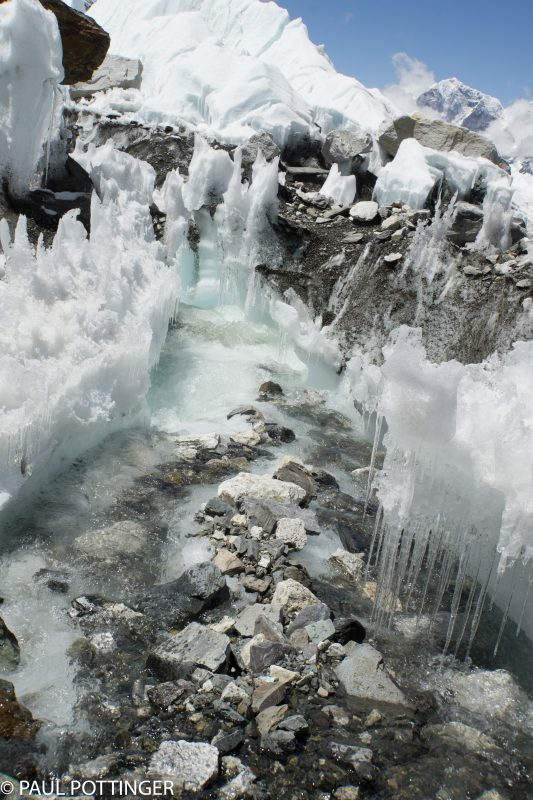 The rapids of Everest… glacial meltwater at its finest. I suppose the floor looks a bit rocky for a shot in swimsuits…. 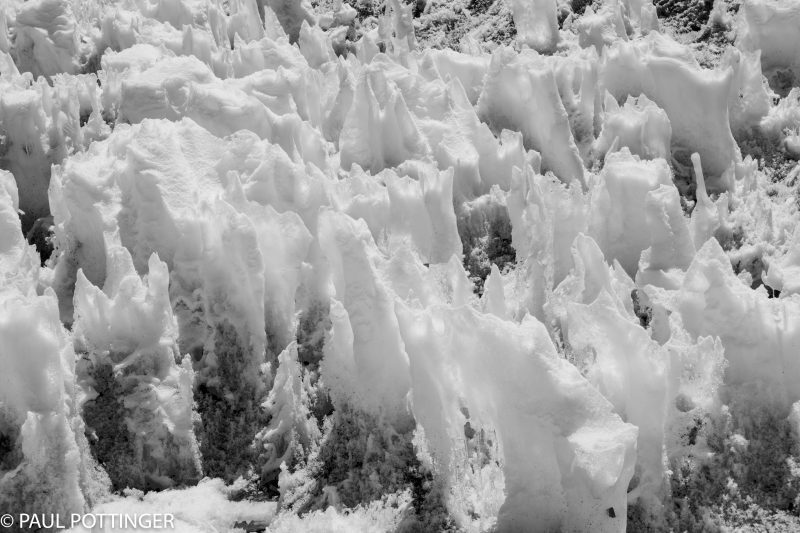 Suncupping twists the ice into beautiful shapes… these formations remind me of sea sponges. The weather was nice that day, perfectly sunny and calm, as we often get before noontime. 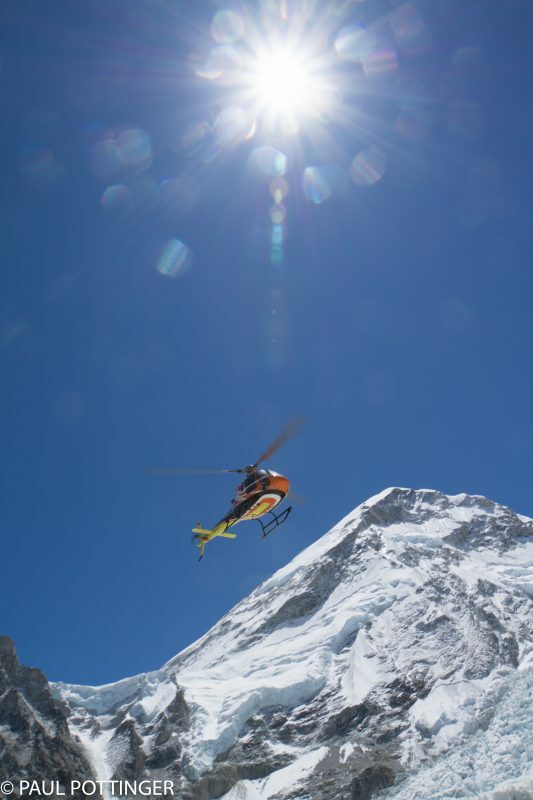 I had lots of freedom to watch the icefall carefully, to look for teams descending from their summit rotations. My friend Mary had stood on top with a different expedition two days before, and I reckoned that she was due to come home that morning; I wanted to snap her photo, as a small gift. 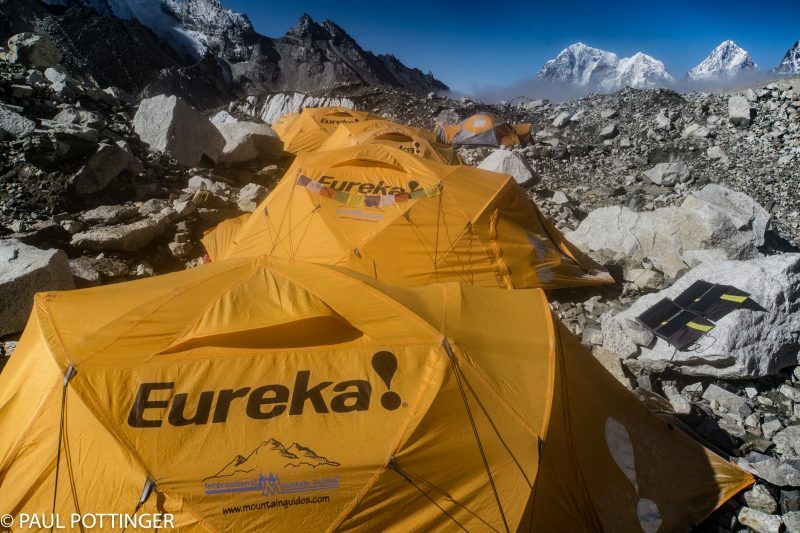 Little did I know that in fact she and team mates had been pinned down at the South Col in a ferocious wind storm, and would not be down for another 24 hours. 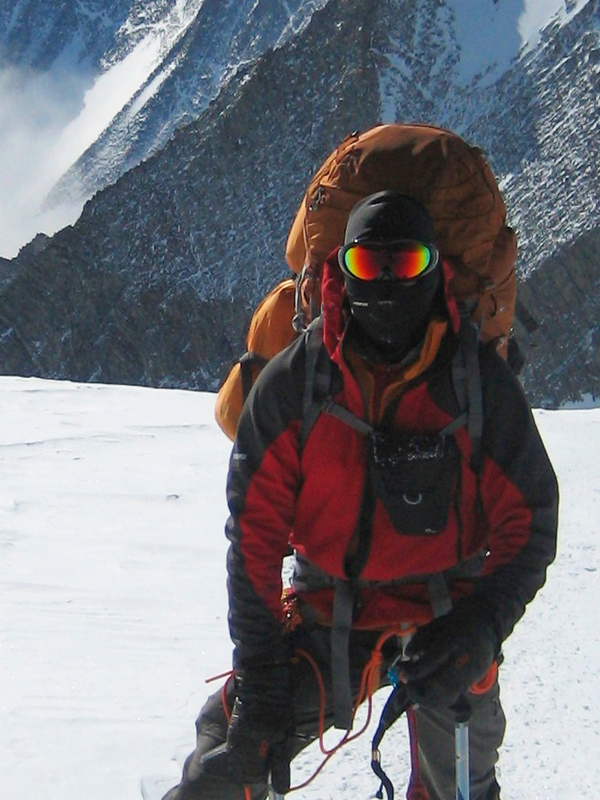 There was little activity on the icefall, and eventually I gave up and headed home. 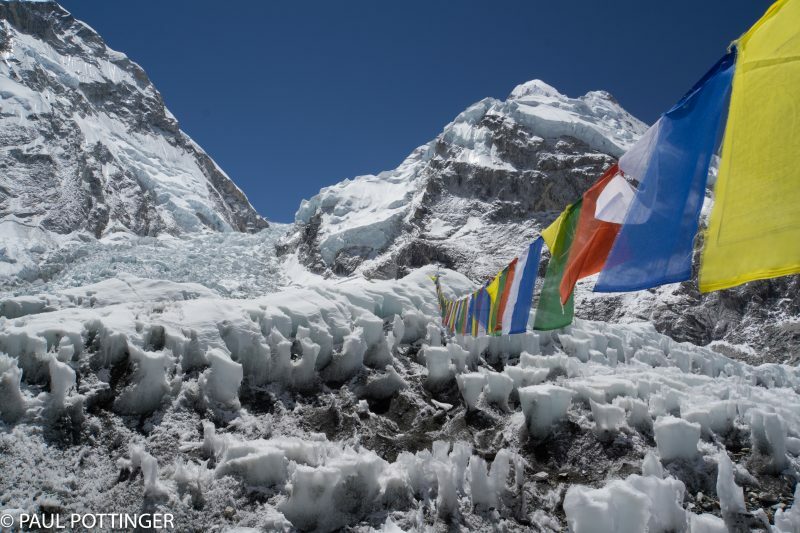 These prayer flags are a hassle during our climbs, because they swing low enough to catch our ice axes strapped to our backpacks. During the day, though, they certainly are beautiful. Air traffic was much lower today… but not zero. 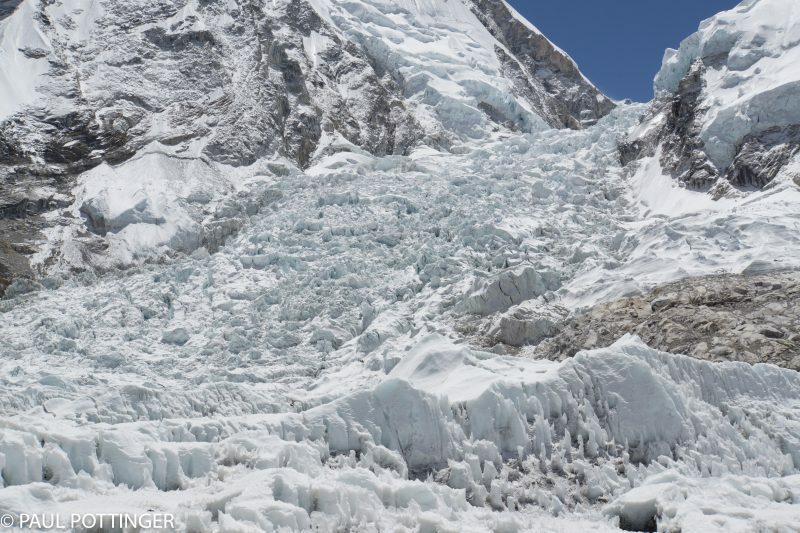 Our nemesis, the formidable gate-keeper to Everest: the Khumbu Icefall. 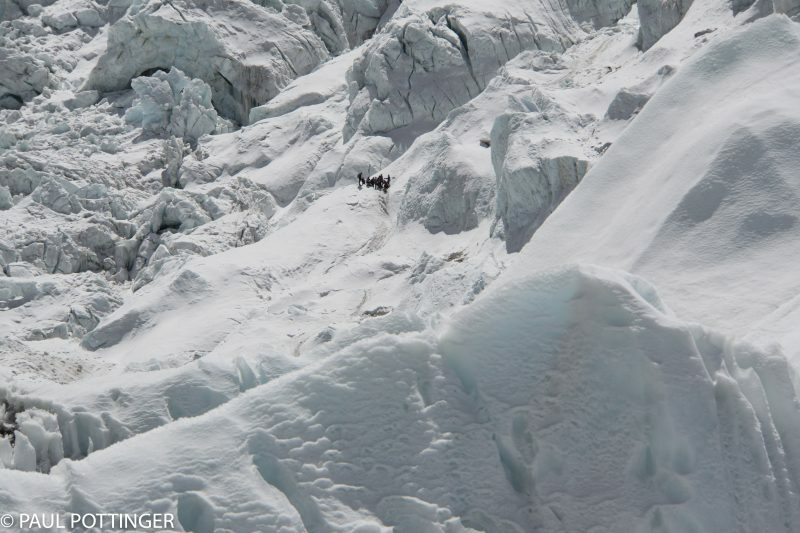 Can you spot the team of climbers making their way down…? 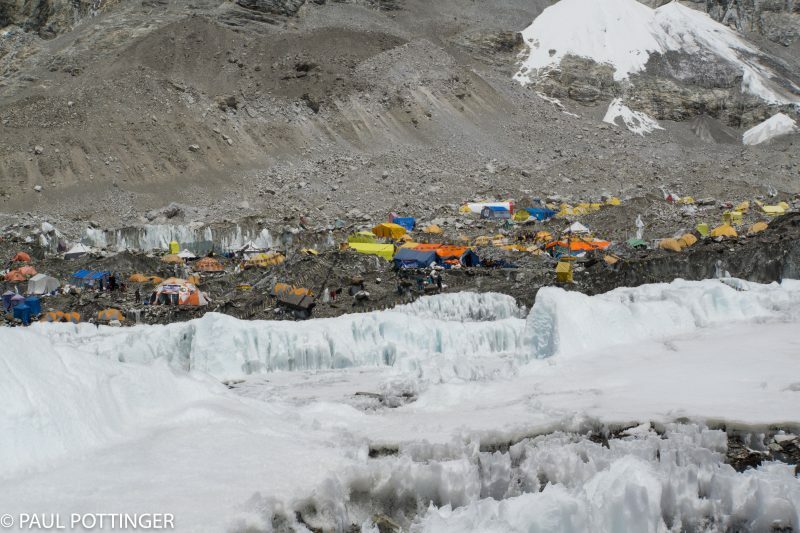 Look closely for dark figures at 6:30 from the center of the image, atop a snow plateau. See them now? they are just below the Toilet Bowl. Upper EBC seen from the glacier. 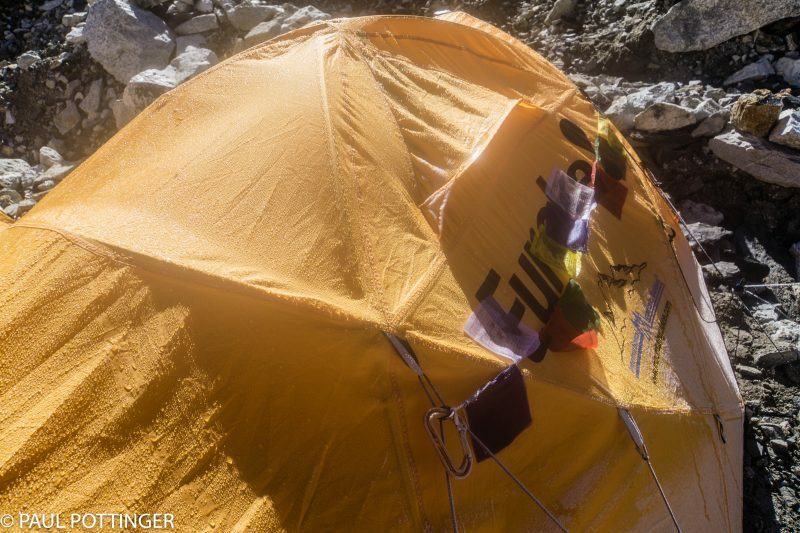 No news of weather changes at lunch… clearly, we would not climb tonight. And yet… after lunch, there was considerable activity in the HQ tent, and everyone was eager to know what was happening. Just before dinner, we got the news: The weather models had changed substantially, and we had a good-looking window on May 21. To catch it, we needed to leave that night. We knew this might happen, so most of the packing and organizing was already accomplished. Still, I wanted to be sure that everything was right—there would be no second chances—and this meant fussing and fidgeting with the kit until about 9 PM. I was able to call my family, which was lovely, although the connection was weak. I slept poorly that night, waiting for the 1 AM alarm. I forced myself to stay calm, to try to relax. 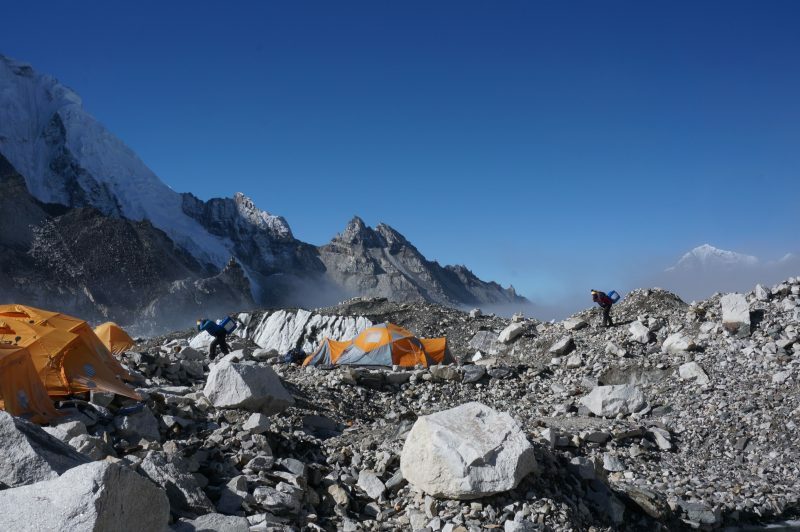 I knew that I’d done fine on the route so far—parts of it multiple times—including Camp 3 (where my slow ascent seemed to have been caused by illness). You’ve got this. The other part of my mind was too excited to let me rest. This is it. The summit! Iconic thought of the day: No pressure. Can’t wait to read about your summit experience. Thanks for letting me follow along! So happy for you! So nice of you, Mary Beth. Will update the blog soon…. Working on it… so glad to have you aboard Steve! Keep writing Paul – this is my work break!